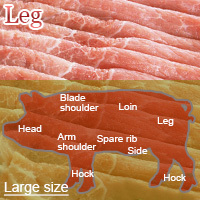 Pork leg or ham is taken from the hind legs of pig. It is rich in vitamin B1 and potassium. It can be used to make roasted pork fillet, smoked ham, and ham steaks. The calories in Pork Leg per 100g(1cut ) is 183 calories. Pork Leg is calculated to be 183Cal per 100 grams making 80Cal equivalent to 43.72g with 20.5g of mostly protein、10.2g of fat、0.2g of carbohydrates in 100g while being rich in vitamins and minerals such as Vitamin B1 and Niacin.